Simply put, culinary genomics describes the relationship between how the food you prepare and eat influences your genes. You are born with a unique gene blueprint. Genes direct the action of making proteins in your body. Proteins are essential to life. They are not only the basic building blocks in the human body, but they are instrumental in how your body manages its daily tasks While many things influence how your genes behave (e.g., exercise, stress and the environment you live in), nothing is more influential than food. In this blog article, I will describe how food interacts with your genes, how this food-gene relationship influences your health, and why the kitchen is so important. Culinary Genomics: how the food you eat influences your unique genes. In 2015, I was presenting at a clinical conference in Johannesburg, South Africa. I was with a team of experts introducing the new science of nutrigenomics and how we translate that science at the grocery store or in the kitchen. Let me describe nutrigenomics before I introduce culinary genomics. Think of nutrigenomics as the science of a food-gene conversation. For example, certain herbs such as rosemary, oregano and thyme can turn on genes that produce antioxidants. Antioxidants perform damage control by stabilizing free radicals that are destructive to your cells and tissues. Another example is inflammation. Spices like turmeric or ginger can reduce the activation of inflammatory genes. Imagine talking to clinicians about the power of food to turn on and off these pathways in the body. In 2015, they were excited. Today they are excited. But NOTHING compares to the excitement of showing clinicians and people like you how we walk this food-gene talking science into the kitchen and put it on your plate. This is Culinary Genomics. Read more about herbs and spices here. Culinary genomics puts the right ingredients, prepared in the right way, onto your plate. After the introduction to Culinary Genomics in South Africa, I presented the same idea to clinicians and chefs at the Institute for Functional Medicine conference in Austin, Texas. I asked the audience to think about ordering in a restaurant. In a restaurant, you give your order to your server. Your order is then communicated to the kitchen. Chefs in the kitchen prepare your order according to the way you want your meal prepared, including ingredient substitutions, dressings on the side, etc. Your server delivers your meal to your table. The chefs act like your genes, making your proteins (meal) to order. Just as you place an order for a meal in a restaurant, you can prepare a unique order for your genes. We now know how to connect the food you eat to genes whose proteins direct critical processes in your body. This knowledge gives you enormous power over your health! Just as your restaurant order is communicated to the kitchen, so the food you eat is communicated to your genes. The power of culinary genomics lies not just in which food communicates with which genes (nutrigenomics), but how you prepare the food too. This is the culinary aspect of culinary genomics and where the kitchen is center stage to your health. I am going to show you the power of food in your kitchen, but a word about food first. I can’t walk you to the kitchen, without a little pep talk about food. You now know that food is the chief information source for your genes which are at the heart of how you operate. Just as your phone’s operating system is essential to all its functions (e.g., camera, apps, screen brightness), your genes are YOUR central operating system and they need food to function. Now, imagine dropping your phone in the swimming pool and hoping it will work at 100 percent capacity afterwards? Highly doubt it. It may not function at all. It might hobble along before finally giving out. Phones and water don’t mix very well. When you provide food information to your genes, and that food comes with a layer of pesticide residue, heavy metals, or is cooked in rancid oils, your genes don’t work very well either. Yes, it’s true your body is naturally armed with biochemical processes (enabled by genes) that can detoxify these contaminants. Missing in the conversation is the fact that many of us have detoxification genes that are not working at 100 percent. I know this because I see it in myself and many of my clients (and have tested for it). If you don’t have genomic test information (or advanced lab information) to show how well your body manages the process of detoxification, you truly have no idea how your body handles residues on food or any other pollutant either. Eat whole foods as much as you can, with as many as possible raised by a producer you know and trust. Don’t be fooled by the concept of “tolerance, or maximum residue limits” in foods and believe they are safe for your body. See next point. It’s not about any one standard. It’s about the total burden of all contaminants from all sources in your life: air, water, food, household products, cosmetics, bath products, laundry products, etc. Food is one source. Make it a clean source. It talks to your genes. You now know that food communicates with your genes. That being said, what you do in your kitchen is the true power of culinary genomics. It enables you to provide food information in ways that your genes understand. The kitchen is the critical connector between the food you buy and its interaction with your genes and your health. Culinary genomics determines which food to prepare and how to prepare it. 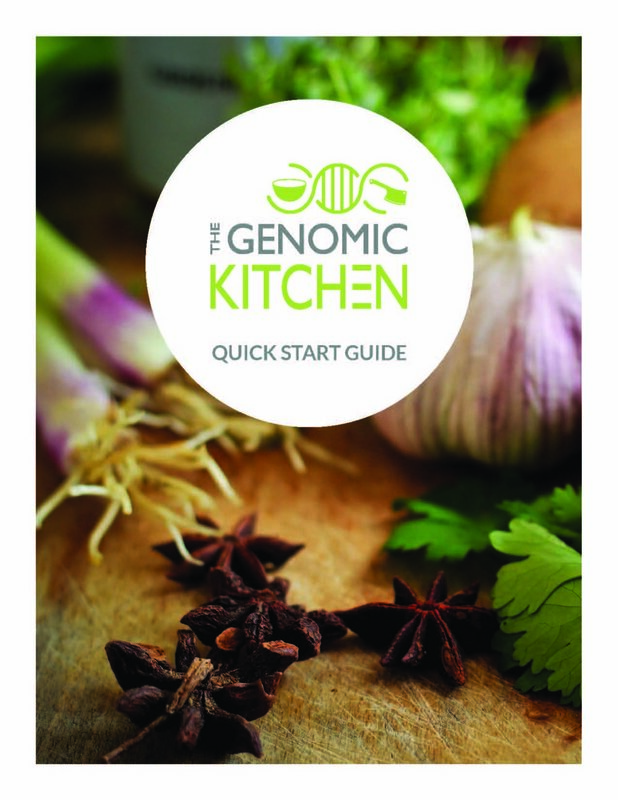 In the Genomic Kitchen, we scoured the science for more than three years to create a toolbox of ingredients that collectively offer the best communication with your genes and your health. Download our Quickstart Guide to learn more about these ingredients and what they do. Food science is also at the heart of culinary genomics. Food science helps us understand how to prepare ingredients so that we retain the bioactives, vitamins and minerals that secure our best food-gene conversation. For example, we know that heat and cooking in liquid can destroy Vitamin C in food. Bioactives are sensitive to heat in the same way. These non-nutritive components in certain foods are essential to activating or deactivating genes. We want to retain them in their most potent “active” form. Food science tells us which cooking techniques preserve them in their active or “user-friendly for your body” form. Cooked and sun-dried tomatoes contain lycopene which activates antioxidant-producing genes. These forms of tomatoes communicate with your genes. Raw tomatoes are rich in vitamin C, but don’t activate genes! Quercetin (found in onions, leeks, garlic and radishes) and kaempferol (found in red raspberries, capers and tomatoes) are far more tolerant of heat during cooking than other bioactives. When you roast turmeric root, you produce additional bioactives that can turn on antioxidant-producing genes. You have to cut cruciferous vegetables and let them sit for up to an hour to produce a heat-stable bioactive called sulforaphane which is a powerful gene activator. Learn more about the best cooking methods to support your genes. How so, you ask? Well, culinary genomics describes the relationship between how the food you prepare and eat influences your genes. But remember that genes produce proteins. To do their work, proteins need vitamins and minerals. So as we think about which food to choose to activate or deactivate genes, we also think about how to ensure the proteins they produce have the nutrient support they need. Which systems in the body do I need to support? Which nutrients are needed to provide that support? Which food delivers those nutrients? Which culinary technique provides those nutrients in their best form? Which recipes and meal ideas put these concepts on the plate? This is precision work and life-changing work. Food is the best information your body can use. Culinary genomics ensures you get the best information from your food by helping you understand which food to buy, what it does in your body and how to prepare it to satiate you and your genes. The great thing about culinary genomics is that you can immediately apply the concepts without a genomic test! You see as humans, genes respond to food the same way. This means that the bioactive in rosemary or thyme that can activate specific genes in your body, can do the same thing in mine. The curcumin in turmeric turns off the TNF-alpha inflammatory gene in your body, the same way it does in mine. The difference, as determined by genomic and lab testing, is how much of a certain food you need and not whether you need it! This means you can take advantage of this science and culinary translation right now! You can go to the grocery store, grab the foods I suggest, walk right into your kitchen and start cooking in a language that speaks to your genes. Learn more about how to make the best of your food dollar in the grocery store here. This is what we do at The Genomic Kitchen! We teach you how to choose and prepare food that talks to your genes. This is culinary genomics. Rescigno T, Micolucci L, Tecce MF, Capasso A. Bioactive Nutrients and Nutrigenomics in Age-Related Diseases. Molecules. 2017;22(1):105. Percival S, Vanden Heuvel JP, Nieves JN et al. Bioavailability of Herbs and Spices in Humans as Determined by ex vivo Inflammatory Suppression and DNA Strand Breaks. J Am Coll Nutr. 2012 31 (4) 288-294.